Verily I say unto thee, Today shalt thou be with Me in paradise. – Luke 23:43. But the other one had experienced a great change. He stopped mocking the Savior; and he rebuked his companion, saying: “Dost not thou fear God, seeing thou art in the same condemnation? And we indeed justly; for we receive the due reward of our deeds. But this Man hath done nothing amiss.” And he said unto Jesus: “Lord, remember me when Thou comest into Thy kingdom!” And Jesus said unto him: “Verily I say unto thee, Today shalt thou be with Me in paradise.” – O precious word of our Redeemer! It shows that Jesus receives the very worst of sinners when they come to Him in true contrition and faith. It shows that Jesus receives them even if they come to Him in the very last hour of life, after long living in sin. It shows that Jesus gives them the same blessedness which He gives to the greatest saint, and He gives it at once, without an intervening purgatory. Let everyone comfort himself herewith! 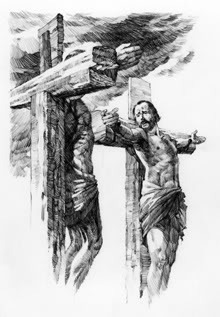 − And this whole delightful story shows how alone a man may come to true faith in the Savior: By seeing and hearing Christ Crucified, as we may do now in His Word. And it shows what fruits of faith are produced: Sorrow for sin, childlike trust in Jesus, a blessed hope in death, a bold and cheerful confession of Jesus, and patience in cross and affliction. May all here take a lesson! − Christian, show the same fruits of faith as that malefactor who repented in his last hour. Renounce the devil and your sins of the past, and strive with the help of God to amend your life out of love for the Savior who first loved you! May God help you! PRAYER. – O Jesus, grant to me the mercy which Thou didst grant the thief. Not that I am worthy of it, but grant it because Thou dost love to show mercy for Thine own sake. Remember me in Thy grace and mercy. Forgive me my great and numerous sins. Uphold me in Thy Kingdom of Grace (the Holy Christian Church, the Communion of Saints) by saving faith in Thee. When my last hour comes, receive me into Thy Kingdom of Glory (heaven, paradise). Give me true knowledge of Thee through the preaching of Thy cross. Grant to me at all times the spirit of true repentance, firm confidence in Thee, sure hope of eternal life, a new heart and the courage cheerfully to confess Thy name, to serve Thee, and to suffer patiently. Have mercy on me, O Jesus! Amen.